Developers of phpMyAdmin, one of the most popular and widely used MySQL database management systems, today released an updated version 4.8.4 of its software to patch several important vulnerabilities that could eventually allow remote attackers to take control of the affected web servers. "We are inspired by the workflow of other projects (such as Mediawiki and others) which often announce any security release in advance to allow package maintainers and hosting providers to prepare. We are experimenting to see if such a workflow is suitable for our project," phpMyAdmin release manager Isaac Bennetch told The Hacker News. phpMyAdmin is a free, open-source administration tool for managing MySQL databases using a simple graphical interface over the web-browser. Almost every web hosting service pre-installs phpMyAdmin with their control panels to help webmasters easily manage their databases for websites, including WordPress, Joomla, and many other content management platforms. Besides many bug fixes, there are primarily three critical security vulnerabilities that affect phpMyAdmin versions before release 4.8.4, phpMyAdmin revealed in its latest advisory. 1.) Local file inclusion (CVE-2018-19968) — phpMyAdmin versions from at least 4.0 through 4.8.3 includes a local file inclusion flaw that could allow a remote attacker to read sensitive contents from local files on the server through its transformation feature. 2.) Cross-Site Request Forgery (CSRF)/XSRF (CVE-2018-19969) — phpMyAdmin versions 4.7.0 through 4.7.6 and 4.8.0 through 4.8.3 includes a CSRF/XSRF flaw, which if exploited, could allow attackers to "perform harmful SQL operations such as renaming databases, creating new tables/routines, deleting designer pages, adding/deleting users, updating user passwords, killing SQL processes" just by convincing victims into opening specially crafted links. 3.) Cross-site scripting (XSS) (CVE-2018-19970) — The software also includes a cross-site scripting vulnerability in its navigation tree, which impacts versions from at least 4.0 through 4.8.3, using which an attacker can inject malicious code into the dashboard through a specially-crafted database/table name. 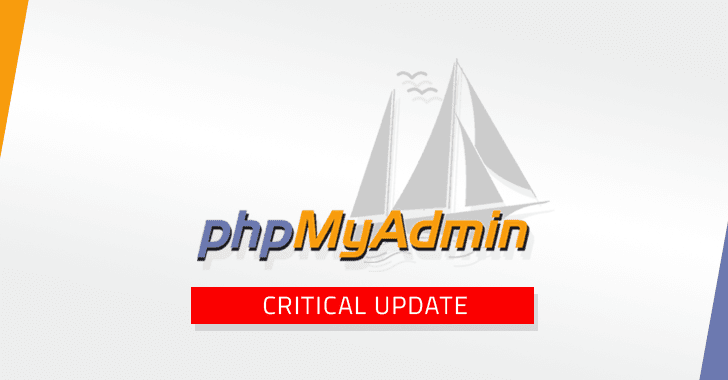 To address all above listed security vulnerabilities, phpMyAdmin developers today released the latest version 4.8.4, as well as separate patches for some previous versions. Website administrators and hosting providers are highly recommended to install latest update or patches immediately.